You agree not to use the Website in a way that may impair the performance, corrupt the content or otherwise reduce the overall functionality of the Website. You also agree not to compromise the security of the Website or attempt to gain access to secured areas or sensitive information. You agree to be fully responsible for any claim, expense, liability, losses, costs including legal fees incurred by us arising from any infringement of the terms and conditions set out in this agreement. 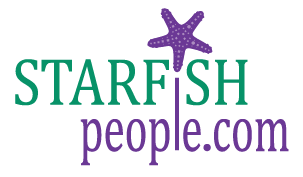 Starfish People Ltd has complete discretion to modify or remove any part of this site without warning or liability arising from such action. Starfish People Ltd will under no circumstance be liable for indirect, special, or consequential damages including any loss of business, revenue, profits, or data in relation to your use of the Website. All intellectual property of Starfish People Ltd such as trademarks, trade names, patents, registered designs and any other automatic intellectual property rights derived from the aesthetics or functionality of the Website remain the property of Starfish People Ltd.
By using the Website, you agree to respect the intellectual property rights of Starfish People Ltd. Permission is granted for the printing of hard copies or downloading temporary store pages for personal use or use within your organisation. Permission is not granted for permanent storage of pages nor for any other reproduction or distribution. Reproduction of Starfish People Ltd trademarks other than in order to view this web site is prohibited. The information is provided on the understanding that the website is not engaged in rendering advice and should not be wholly relied upon when making any related decision. The information contained with the Website is provided on an “as is” basis with no warranties expressed or otherwise implied relating to the accuracy, fitness for purpose, compatibility or security of any components of the Website. We do not guarantee uninterrupted availability of the website and cannot provide any representation that using the Website will be error free.